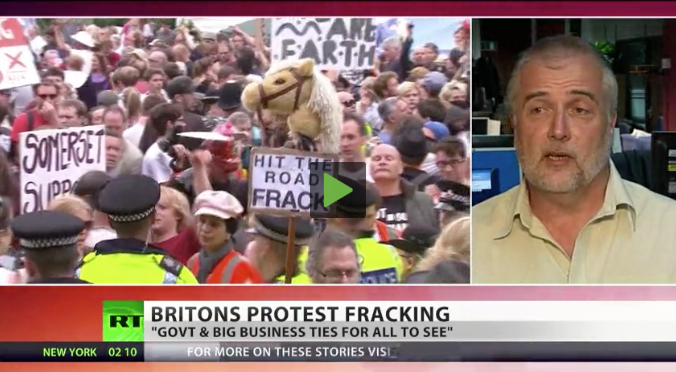 RT’s news story features excellent coverage from Balcombe, including the ever-impressive Vanessa Vine being interviewed; an excellent summary of the main environmental issues associated with fracking; and a discussion of the political fallout with me, via a satellite link between Moscow and Cardiff (BBC Wales newsroom). The website includes additional commentary and coverage of today’s events, including the arrest of Caroline Lucas. There are also further quotes from me about the process and geology. This entry was posted in Uncategorized on August 19, 2013 by Bridgend's Green Leftie. A media company not afraid to tell about the chemicals that are put into a fracking well and the lasting effects they will have on the population and environment. A great pity it wasn’t a UK media company. The British media only talk about water and sand being put down these wells of death. Whilst it’s thanks to all support for the anti-fracking campaign signaling the end of fossil fuels in the UK, be aware that Russia seeks customers for their own gas. Some might be consider this an own goal. If there is any substance in the ‘transitional fuels’ argument (and I would question that) it has to be that we use existing conventional resources from anywhere (yes, even Russia) while we get our acts together on renewable long term energy security as fast as poissible (see Germany, Denmark etc. ), and certainly before getting involved with the madness of extreme fossil fuel technologies (anywhere).